Got that? There’s only one kind of fraud that voter ID stops: in-person voter fraud. That is, the kind of fraud where someone walks into a polling place and tries to vote under someone else’s name. That’s it. There are plenty of other types of voter fraud, of course. There’s registration fraud, where you send in forms for Mary Poppins and James Bond. There’s insider fraud, where election officials report incorrect tallies. There’s absentee ballot fraud, where you fill in someone else’s absentee ballot and mail it in. But a voter ID law does nothing to stop those kinds of fraud. Even in theory, the only kind of fraud it stops is in-person voter fraud. There are virtually no recent cases of voter impersonation fraud and no evidence in at least a generation that it has been used in an effort to steal an election. Hasen provides what few examples he can. Hans von Spakovsky, a Bush-era Justice Department appointee, claimed to have found an occurrence of impersonation fraud in a 1984 case in Brooklyn. But when Hasen finally managed to get a copy of the DA’s report (von Spakovsky refused to share it), it turned out that the fraud consisted almost entirely of insiders manipulating registration books and cards. What little impersonation fraud they found was possible only thanks to collusion with corrupt election officials. Von Spakovsky also brought up a 1997 case in Miami, but that turned out to be absentee ballot fraud. In a later op-ed, he pointed to a case in Kansas, but a court ruled that, in fact, no illegal votes had been cast. So there you have it. Hasen apparently doesn’t know of any confirmed cases of in-person voter fraud, and the folks who have tried their best to find some have failed. 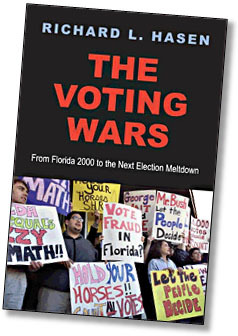 There are several known cases of other kinds of voter fraud (though not very many, despite the Bush administration’s focus on digging up voter fraud cases), and there are also cases of, for example, felons voting when they aren’t allowed to. But these almost all turn out to be accidents: the state sent them registration forms, so they registered and voted, not knowing it was illegal. It was incompetent registration operations that were at fault, and anyway, voter ID wouldn’t have stopped it. The felons’ names were all on the voter rolls. So we’re left with this: the folks pushing the idea that voter fraud is rampant apparently don’t have any examples of in-person voter fraud ever happening in the past decade or so. At a minimum, if this were a serious problem, surely you could dig up, say, one case per state per election cycle. That’s not many. Maybe a few hundred since 2000. But they can’t. They’ve passed dozens of laws, making it harder to vote for millions of people, based on a phantasm. In-person voter fraud is an entirely invented problem. What it was invented for is left as an exercise for the reader. UPDATE: Rick Hasen emails to say that he recently came across a case that might be genuine in-person voter fraud. The allegation is something stupid (a mother taking her teenage son to vote in her husband’s place), not something corrupt, but still. It’s a case! If the facts are proven as alleged, this looks like it could be one of those extremely rare cases in which a photo identification actually would have made a difference in preventing the casting of a fraudulent ballot, and for this reason I expect it to gain canonical status among those clamoring for voter ID….For reasons explained in my last post, however, the very stupidity of this action (if proven) and the fact that this kind of ham-handed fraud was so easily caught shows why this kind of fraud is so rare and why state voter ID laws are generally unnecessary.